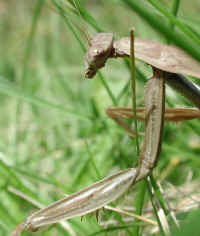 (Praying Mantis (Mantis religiosa) - 01) The praying mantis is also a preying carnivore, which eats other insects. 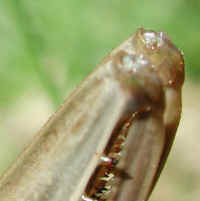 It holds its prey in the enlarged toothed forelegs. 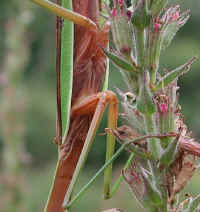 (Praying Mantis (Mantis religiosa) - 01a) Praying mantises get their name from the way they sit up on their middle and rear legs with their front legs folded in front of them, as though they were praying. 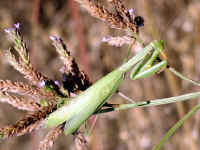 (Praying Mantis (Mantis religiosa) - 02) Praying mantis can be very difficult to spot, as their coloration and shape blends into the surroundings, as does this one in the grass. 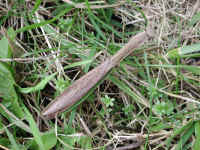 (Praying Mantis (Mantis religiosa) - 03) We found this close-up photo of the praying mantis' right rear leg particularly interesting, as its bent position is very similar to the adjacent grass. (Praying Mantis (Mantis religiosa) - 04) This praying mantis allowed us to get very close and take several interesting photos, such as this one. (Praying Mantis (Mantis religiosa) - 05) This is an even closer look at the back of the head and neck of this praying mantis. We marvel at the complexity of design that God created even in His little folk. 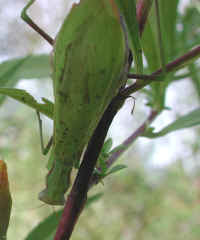 (Praying Mantis (Mantis religiosa) - 06) This praying mantis is on a loosestrife that is going to seed. 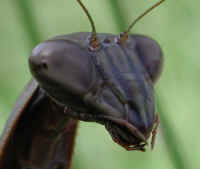 (Praying Mantis (Mantis religiosa) - 06a) In this close-up photo, we can see the underside of this praying mantis' head, neck, and forelegs. 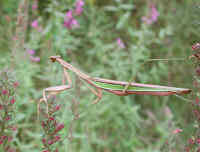 Note that the forelegs are not supporting this praying mantis; all support is provided by the middle and hind legs. 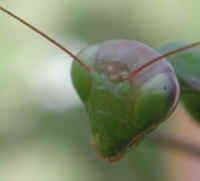 (Praying Mantis (Mantis religiosa) - 06b) This close-up photo shows us the underside of the praying mantis' body where the wings and middle and hind legs are attached. 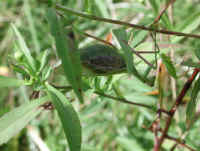 The middle legs seem to be barely touching the loosestrife, yet they are able to lift the whole body. 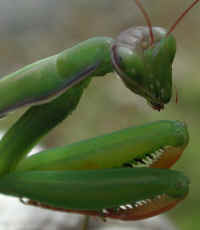 To us, this is proof that the praying mantis has a very sensitive sense of touch and excellent mind/body coordination. 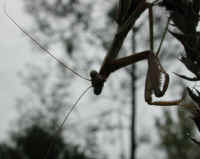 (Praying Mantis (Mantis religiosa) - 07) By taking this photo of this praying mantis toward the bright sky, we were able to get this interesting silhouette. 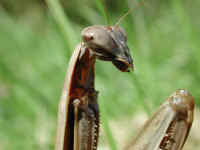 He or she is looking at us and the camera with considerable interest. (Praying Mantis (Mantis religiosa) - 08) This is another close-up silhouette of our friendly praying mantis. 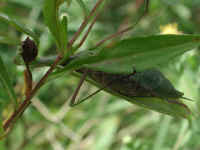 (Praying Mantis (Mantis religiosa) - 09) This is another photo of the praying mantis as he or she moved about on the loosestrife. (Praying Mantis (Mantis religiosa) - 10) The praying mantis continued to move about on the wildflower as we took more photos. (Praying Mantis (Mantis religiosa) - 11) This is another silhouette of the praying mantis, who was watching us as we took this photos. (Praying Mantis (Mantis religiosa) - 12) In this photo of the praying mantis we get a good look at the underside of the lower abdomen. 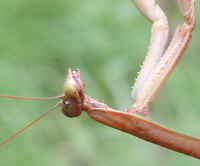 (Praying Mantis (Mantis religiosa) - 13) This is another close-up of the praying mantis' lower abdomen and hind foot. 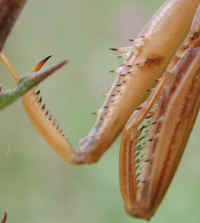 (Praying Mantis (Mantis religiosa) - 14) This is a close up look at the praying mantis' foreleg gripping claws. 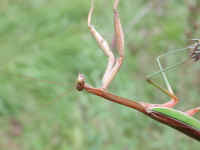 (Praying Mantis (Mantis religiosa) - 14a) Just as we were taking this close up photo of the praying mantis' foreleg "knee joint," he or she moved his or her middle leg forward, but we can still see the intricate structure of the foreleg. 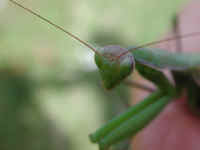 (Praying Mantis (Mantis religiosa) - 15) Every time I would try to get a frontal picture of this praying mantis, he or she would reach out and try to climb, in a very gentle and friendly manner, on my finger or the camera. 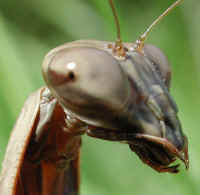 One day, as Isaiah prophesied (11:6-9), even the praying mantis will no longer hurt or destroy. Perhaps our gentle and friendly encounter was a prelude of that day. (Praying Mantis (Mantis religiosa) - 16) There was a mutual fascination between this praying mantis and us, as we observed each other for several minutes. 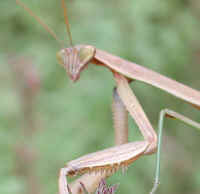 Praying mantis have excellent vision for a distance of about 60 feet, and perhaps longer distances. (Praying Mantis (Mantis religiosa) - 16a) This is a side view of a portion of the mid section of the praying mantis, and the folded right wing. 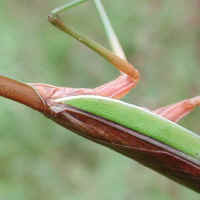 (Praying Mantis (Mantis religiosa) - 16b) This is a closer, side view of the upper body of the praying mantis. (Praying Mantis (Mantis religiosa) - 17) After a while, the praying mantis reached out to the top of another loosestrife that was swaying in the breeze. 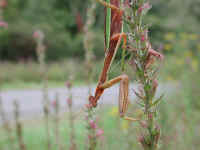 (Praying Mantis (Mantis religiosa) - 17a) From his or her perch upon a loosestrife, this praying mantis surveys the surrounding field. 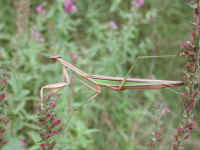 (Praying Mantis (Mantis religiosa) - 18) This is another photo of our friendly preying mantis forming a bridge between two loosestrife flower stalks. 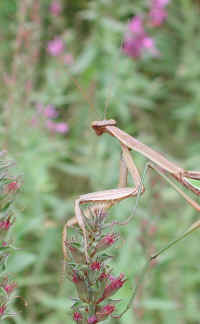 (Praying Mantis (Mantis religiosa) - 19) Friend praying mantis then looked toward us. (Praying Mantis (Mantis religiosa) - 19a) We said our good-byes to one another and we continued on our walk, leaving this praying mantis to go about his or her business. (Praying Mantis (Mantis religiosa) - 20) While we were on one of our walks, we spotted this praying mantis sunning him or herself on the road, and were afraid that he or she could be killed. 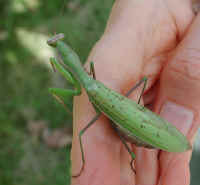 (Praying Mantis (Mantis religiosa) - 22) This praying mantis was very friendly, and we couldn't help but think of how wonderful it would be if this species were just as friendly to other insects, and that they, too, would live in the peace that Isaiah prophesied about (Isaiah 11:6-9). However, for the time we were together we all had a glimpse of the "Peaceable Kingdom." (Praying Mantis (Mantis religiosa) - 22a) Every time we have these close encounters with another species, like this praying mantis, we thank God for the experience. (Praying Mantis (Mantis religiosa) - 22b) The same legs of the praying mantis that can take another's life, gently reached out and touched the camera and climbed on to my hand, and we carried him or her off the road. In this respect, they are very much like humans. (Praying Mantis (Mantis religiosa) - 23) Once we had set friend praying mantis down in the grass on the side of the road, we resumed taking more photos. (Praying Mantis (Mantis religiosa) - 24) We marvel at the intricate detail that God created into the praying mantis, and even into a foot. 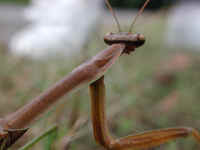 (Praying Mantis (Mantis religiosa) - 25) The head and knees of this praying mantis are in the classic "praying" position. (Praying Mantis (Mantis religiosa) - 25a) There is something awe inspiring about being able to get so close to a living, wild, and free little soul like this praying mantis, that we can even see the tiny hairs on the mouth parts. (Praying Mantis (Mantis religiosa) - 26) By slowly moving the camera, we were able to get a slightly more profile picture of this praying mantis' head. 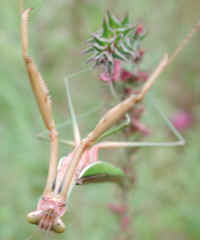 (Praying Mantis (Mantis religiosa) - 27) This is another photo of the praying mantis in the classic "praying" position. 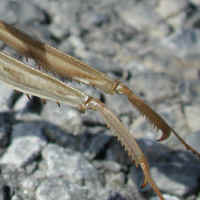 (Praying Mantis (Mantis religiosa) - 27a) This is a close-up look at the praying mantis' foreleg knee joints and claws. 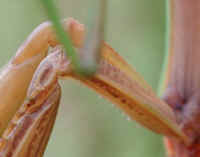 (Praying Mantis (Mantis religiosa) - 27b) With the sun shining on this praying mantis, we can even see the extremely tiny hairs on the head, and also the joints in the neck that allow the praying mantis to turn his or her head without turning his or her body, as is necessary with other insects. (Praying Mantis (Mantis religiosa) - 28) As we neared the end of our visit, the praying mantis turned around and prepared to leave. (Praying Mantis (Mantis religiosa) - 29) Our friend praying mantis slowly walked off into the grass and we continued down the road on our walk. 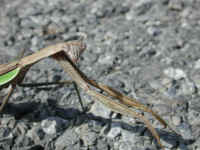 (Praying Mantis (Mantis religiosa) - 30) During one of our early autumn walks (2004), Mary spotted this female praying mantis on the roadway. She picked it up to prevent it from being killed by a passing vehicle. 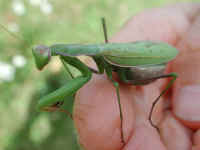 (Praying Mantis (Mantis religiosa) - 31) While praying mantis are not the friends of other insects, they are the most friendly (to us) of any insect that we have met. 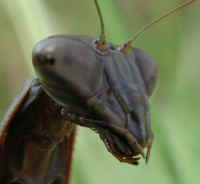 (Praying Mantis (Mantis religiosa) - 31a) This is a closer-up photo of the head of this praying mantis, as we curiously looked at one another. (Praying Mantis (Mantis religiosa) - 32) After resting on Mary's hand for a little while, our friend praying mantis turned and started to walk up Mary's arm. (Praying Mantis (Mantis religiosa) - 32a) In this photo, we have a closer look at the stripes across the top-rear of the head of this praying mantis. (Praying Mantis (Mantis religiosa) - 33) After walking up Mary's arm, this praying mantis decided to walk across her back. 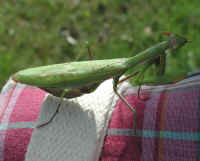 (Praying Mantis (Mantis religiosa) - 34) Our friend, praying mantis, then stopped her walk across Mary's back to pose for this photo. 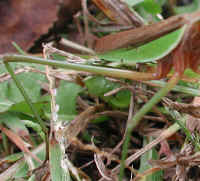 (Praying Mantis (Mantis religiosa) - 34a) We curiously noticed that in this photo, a portion of the praying mantis' left antenna appeared to have broken off, but in other photos, it appears to be there. (Praying Mantis (Mantis religiosa) - 35) The praying mantis then climbed aboard an offered hand, and we gently set her down upon this aster. (Praying Mantis (Mantis religiosa) - 36) Even after being placed on this aster, our friendly praying mantis decided to "hang around" and visit. 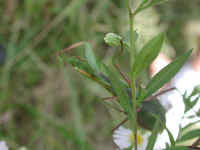 (Praying Mantis (Mantis religiosa) - 37) The praying mantis continued to hang up side down from the leaves and stem of this wild aster. (Praying Mantis (Mantis religiosa) - 38) Mary was helping me focus the camera by placing her hand behind the praying mantis, and immediately our friend once again climbed on her hand and walked up her arm. (Praying Mantis (Mantis religiosa) - 39) Our friend praying mantis then climbed up on Mary's shoulder and looked up at her face. 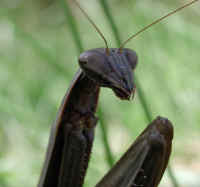 (Praying Mantis (Mantis religiosa) - 40) The praying mantis then turned and looked at the camera. 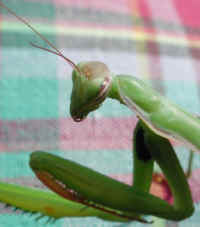 (Praying Mantis (Mantis religiosa) - 40a) This is another close-up look at our friend, praying mantis. 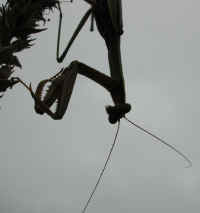 (Praying Mantis (Mantis religiosa) - 41) Once again we gently placed this friendly praying mantis back onto some plants. 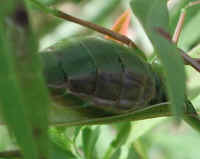 (Praying Mantis (Mantis religiosa) - 41a) In this photo, we can see how swollen this praying mantis' abdomen is with eggs. (Praying Mantis (Mantis religiosa) - 42) We took one more photo of our friend praying mantis, said our good-byes, and continued on our walk.